Dr. G. Allen Power 's book "Dementia Beyond Disease"
Dr. G. Allen Power 's book "Dementia Beyond Drugs"
"Allen Power is my kind of physician -- one who understands the research and who has a big heart. Drawing on years of experience, he presents a compelling case for eliminating the vast majority of antipsychotic medications used to treat unpleasant symptoms of dementia. Family members and caregivers will embrace his compassionate, relationship-based approach. 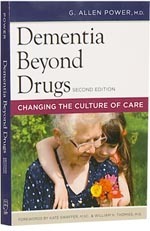 Dementia Beyond Drugs should be required reading for every long-term care provider." "Allen Power's new book, Dementia Beyond Drugs: Changing the Culture of Care, has just stripped you of your last excuse for not understanding what it takes to bring about real culture change within residential care settings while at the same time reducing the administration of psychotropic drugs. He has answers for questions you've had about assisting people living with dementia. Al's grasp of the subject is comprehensive and his style of communicating is informative, accessible, and inspiring. If you implement the information that Al suggests, you can be the person you've always wanted to be when assisting others living with dementia. He's one of the best guides out there on the pathway to understanding care that treats individuals with dementia with the personal attention, respect, and dignity they deserve." Dementia Beyond Drugs: Changing the Culture of Care is a totally engaging book that clearly illustrates the restorative effects of humane care in combination with advances in modern medicine. Dr. Al Power makes a compelling case for deep system change, where knowing the person is paramount in our approach to compassionate elder care. "Using story after powerful story to reveal the shortcomings of a biomedical approach to care, Dr. Power has helped us open our eyes to a new way of viewing those living with dementia. We have created worlds where our elders with dementia do not want to be, then medicated them to keep them there. Dr. Power's "Experiential Model" offers us a viable and humanistic alternative to caring for those with dementia. This model challenges care providers to not only open their eyes, but to also see the beauty and potential of the human spirit that remains. Our elders living with dementia are our greatest teachers and Dr. Power has been an exceptional student. He has learned their lessons well and, in this important book, now shares them with us. I hope we are ready and willing to learn." "Al Power has authored a book that fills an enormous gap in our understanding of how we, as individual caregivers and as a society, can improve the care for those with dementia. Written with his characteristic directness, warmth, and compassion, these pages are filled with new insights and clues as to how to avoid dangerous drug therapy and restore dignity and comfort to these individuals. This book will be a landmark in geriatrics and has something of value to family caregivers and seasoned physicians as well." "This book is groundbreaking, courageous and awesome, representing a new milestone in dementia care. Dr G. Allen Power dares to challenge the current paradigm and urges readers to walk the walk of culture change, creating a better world for people with dementia. This thoroughly researched, practical and deeply compassionate book is a must for all working in the field of dementia." 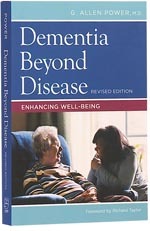 "This is a must have book for your library if you care about persons with dementia. It is filled with practical, valuable information and insights that can transform practice. I highly recommend it."